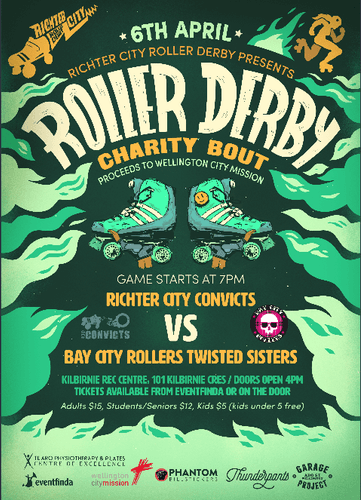 Richter's development team, The Convicts, are taking on Bay City Rollers B Team Twisted Sisters, from Hawkes Bay. Our Garage Project Bar will be open and serving non-alcoholic and alcoholic options (alcohol will not be served to minors) and a variety of other awesome local food options will be available. There will also be RCRD exclusive merchandise available! Friends of Richter City, Wellington Free Ambulance, will be present, for those just-in-case moments, but in the hopes they’re not needed and can just enjoy the event. To ensure the safety of our fans, the first 3 rows of the up-close, trackside seating, which is right next to the track is restricted to aged 18+ only, but there is plenty of other seating, including tiered seating. Doors open at 6pm, first whistle at 7pm. Exit and re-entry available. Door sales available. For media access requests or more info email: richtercitypr@gmail.com.